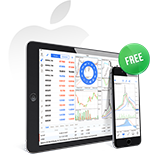 This application is designed for trading on Forex market and analysis of financial instruments via smartphones and tablets. System requirements: iPhone 3G/3GS/4/4S/5, iPod Touch or iPad having iOS 4.0 or higher. MetaTrader 4 iPhone is very similar to MetaTrader 4 for PC by its functionality. 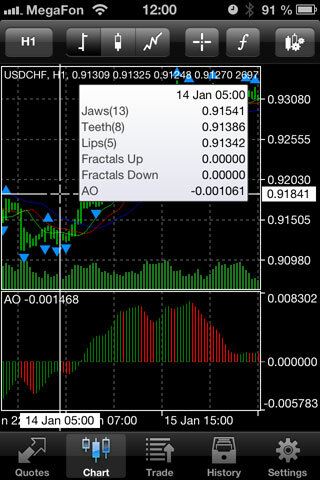 This mobile application supports most PC terminal's features (all trading functions, execution modes, as well as powerful technical analysis) except for the algorithmic trading functions as there seems to be not much call for these functions on iOS platform yet. The application works on all listed smartphones and media players. The application runs in compatibility mode on iPad tablet when the image is stretched on a larger screen. 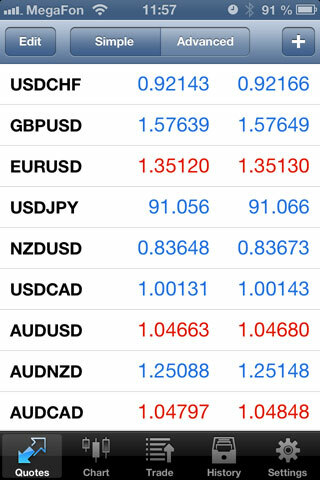 Currently, we are working on the special MetaTrader 4 version for iPad, which will use the tablet's native resolution. The application's interface will be optimized to fit the same resolution. The application requires Internet connection for its operation. It can be a mobile communication or Wi-Fi. The terminal is connected to MetaTrader 4 trade servers using a trader's account. The application can work both with real and demo accounts. 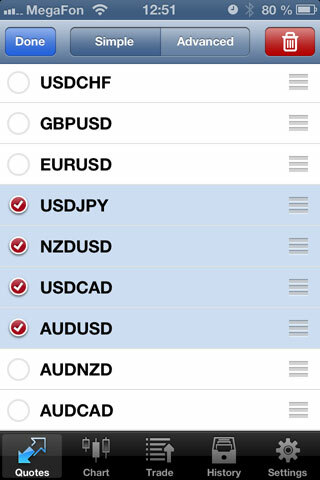 Similar to the PC terminal, users can open demo accounts right in MetaTrader 4 iPhone. The total number of accounts managed by the terminal is unlimited. The quotes for all available symbols are received in real time. The terminal receives and displays the quotes for all available financial instruments. The quotes are displayed in Market Watch, which can be presented in a minimized or detailed way. List of symbols shown in Market Watch can be configured. For example, users can hide symbols they do not need at the moment. Buy and Sell market orders. Sell Stop, Sell Limit, Buy Stop and Buy Limit pending orders. Take Profit and Stop Loss protective orders. All transactions performed via the mobile terminal are identical to the ones performed via the PC terminal. 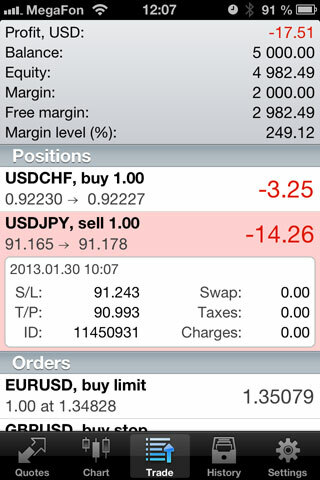 All parameters of trading operations can also be controlled using MetaTrader 4 iPhone. Trailing Stop is not implemented but it may appear in the future. Storing and displaying trading history. The system of transaction history filtration by symbols and time frames is implemented for convenience. 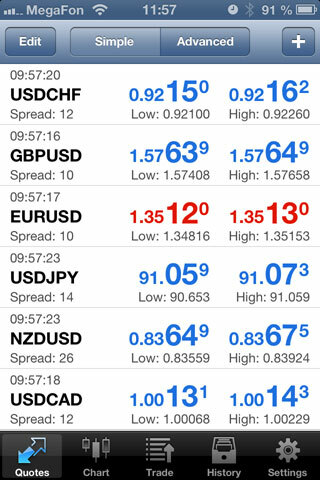 MetaTrader 4 iPhone allows displaying the quotes of all available symbols in charts. Portrait and landscape chart orientations are supported. Users just need to rotate their device to switch between them. The charts are generated based on received quotes of each time frame. A separate base of quotes is used for each period. If there is data concerning М1, but there is no data on М15, it will be uploaded when referring to this chart. There are 7 available time frames - from M1 to D1: M1, M5, M15, M30, H1, H4 and D1. Similar to the PC terminal, charts can be of three types: lines, candlesticks and bars. Traders can easily switch between them. The charts can display volumes, trade levels and OHLC line. Besides, traders can enable Data Window displayed in "Crosshair" mode. It shows accurate quote or indicator values at the selected chart point. For convenience, all indicators are divided into several groups: trend indicators, oscillators, volume indicators and Bill Williams' tools. Indicators can be displayed directly on the chart or in a window. Traders can place several independent analytical tools in one indicator window or develop an indicator based on the data from another one. 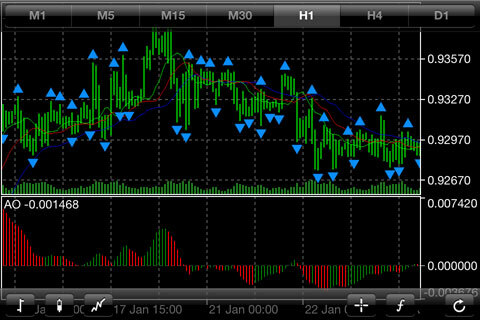 For example, traders may apply Moving Average on Relative Strength Index and obtain a smoothed curve for RSI. The application does not have analytical objects (for example, Andrews Pitchfork, Fibonacci Arcs etc.) but they will be implemented in one of the future builds. Chat - conversation with MQL5.com users. To start a conversation, specify a trader's nickname at MQL5.com. 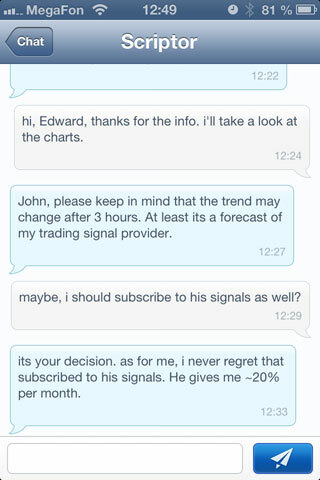 Broker - broker's messages. These are usually targeted and confidential messages on the account's status, performed trade operations etc. Terminal - alerts and notifications from the Expert Advisors launched in the PC terminal. It means that you can launch an Expert Advisor in your PC terminal, which will send free messages to your smartphone or tablet. Community - various messages from MQL5.com, including depositing funds on the account, execution of an ordered work etc. If traders are registered on the web site but they do not show any activity (like leaving forum posts, executing job orders and so on), they will not receive messages of this category. Other - anything that is not related to the previous 4 categories. 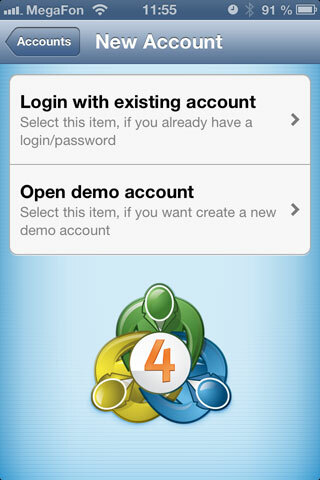 MetaTrader 4 iPhone has built-in Journal recording all user's actions and application's service messages. This data may be useful in case of any dispute between a broker and a trader.